kilala.nl - AWW YEAH! 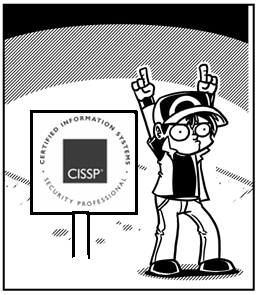 I passed my CISSP exam! But... First step? What's next; taking apart and rebuilding a Cisco swicht in under 15 minutes? Hahaha :D No, nothing so strenuous... There's a bunch of paperwork to file, like my resume and an endorsement by somebody who's already a certificied ISSP. Then there's the possibility of having my documents audited, to verify their authenticity. Congratulations :D I'm really proud of you. We really need to celebrate this! Gefeli! Het plaatje wordt trouwens niet goed weergegeven volgens mij. It's a very nice way to start the holidays.